Considering our troops have been embroiled in the war that we’ve already won over there in Iraq for the last couple of years, I suppose its nigh time that we start getting some Iraq warfare drama coming down the pipe in our cinema. 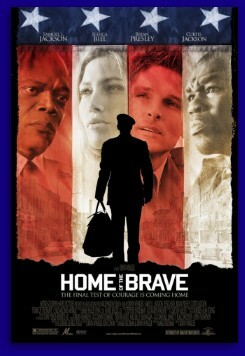 Let’s just hope that future films touching on the war and its veterans is crafted better than MGM’s sappy melodrama ‘Home of the Brave’. This ensemble piece stars Samuel L. Jackson as shell shocked Army Reserve Doctor Will Marsh who returns stateside to find he can’t get the images destruction and death out of his head, top onto that his teenage son hates him, he’s developed a drinking problem and his hot wife (Victoria Rowell) keeps nagging him to ‘talk to me!’. Jessica Biel, who’s pretty damn hot in her own right, is Sgt. Vanessa Price who loses part of her arm in the war and pushes everybody away because they ‘can’t understand!’. Brian Pressley portrays Tommy Yates who loses his best friend during the conflict and is now suffering from Post Traumatic Stress Syndrome and spouts nuggets like ‘You don’t know what I’m going through!’ Thrown in for good measure is Curtis ’50 cent’ Jackson who was Tommy’s gunner mate and suffered a debilitating injury and portrays the movies Angry Black Guy. Our heroes all hail from a small town in the great northwest and find their waterloo during a seemingly routine mercy mission in the deserts of Iraq. of violence. Unfortunately, this was a very small part of the film, as it opened in Iraq and had small flashbacks inserted for filler. The problems mount for this one when it comes back stateside and basically becomes an overly melodramatic Lifetime Network TV movie. Probably the worst part of ‘Home of the Brave’ is the dialog these characters are saddled with, as it seemed every clichéd line that has ever been uttered in any movie, TV show, or stage play, plops out of some characters mouth at some point or another. ‘Help me help you’ or ‘Don’t Lock me out!’ or ‘Please help me understand’ followed by ‘You can’t understand’ or ‘Tell me what you feel.’ followed by ‘That’s just it, I don’t feel anything’. It goes on and on and on, and you could resurrect Lawrence Oliver, Marlon Brando and Meryl Streep, who I guess isn’t dead yet, and they couldn’t have helped save this meager attempt at script writing. Speaking of acting, given what the actors had to work with, the performances mostly come off as flat and uninspired. Sam Jackson whom we all know has yet to turn down a role attached to a check that doesn’t bounce plays a drunk about as well as anybody, as he delivers his rock like, staid, emotionless dialog about as poorly as anyone making x-millions of dollars per film. Jessica Beal, well, she’s pretty damn good looking. Ms. Beal’s conundrum, as she attempts to stretch out into more serious acting gigs, is that her acting skill still hovers around the ‘7th Heaven’ level, which considering that this really should have been a movie of the week joint, ain’t so bad. But she sure is pretty though. Soap Opera vet Brian Pressley may also suffer a bit from being a bit too good looking for his own good (Trust me, it’s a curse for us), but the weak script does try to play on that as he is accused of being Tommy the Movie star a couple of times. Again, his performance is uneven at best, but it’s hard to judge the man based on the material he is given. Curtis Jackson probably gives best performance as the shell shocked Jamal, though he’s only in a couple of scenes, and he still tends to mumble his lines. He does have some presence however and provides a bit of humor in a generally humorless production. Not a great effort by any measurement, the let’s hope the war vets get better treatment as more movies based on their plight go into development in the coming months.